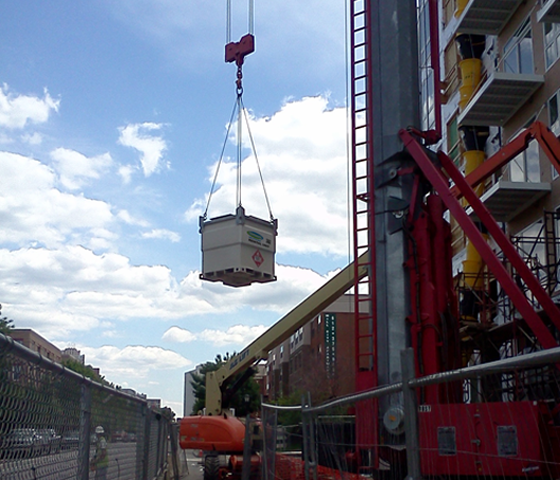 As indicated in the photos, our rental units can be lifted by crane to various locations on a site. This eliminates fuel trucks and/or hand fueling attempts to maneuver around other equipment, reducing liability and easing congestion. This rental unit is a UL-UN-rated, double-walled tank with a pumping system contained within the unit which provides rain water management. 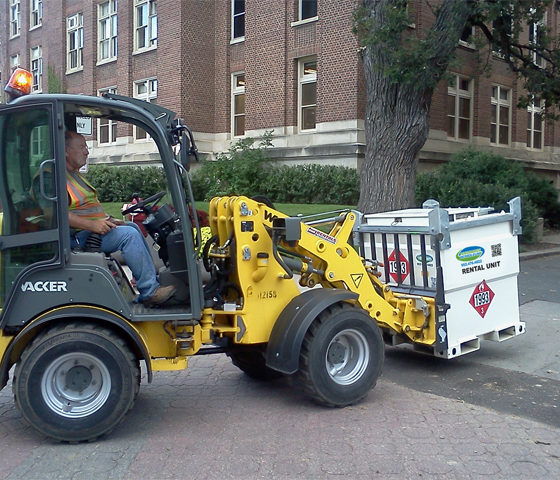 Fuel deliveries to construction customers are commonly accomplished by a fuel truck that fills construction equipment or tanks on-site. These deliveries commonly spit back fuel due to the flow rate of the fuel truck and consequently spills can occur. There are also numerous storage tank regulations that must be adhered to which are additional concerns for the contractor / customer (see MPCA Statute 116.48, Subd 1-8). 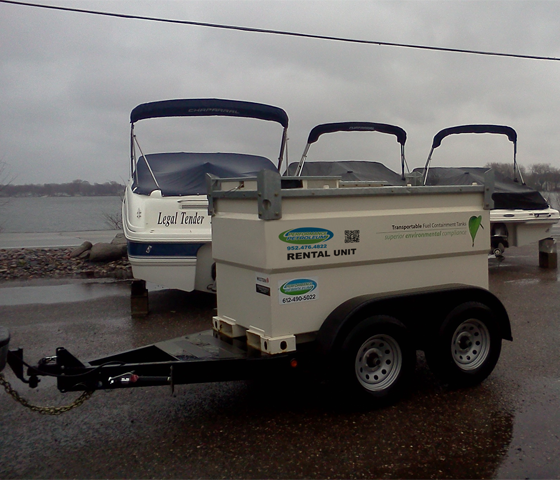 Using our portable rental units eliminates both of these concerns. We deliver compliance and safety. 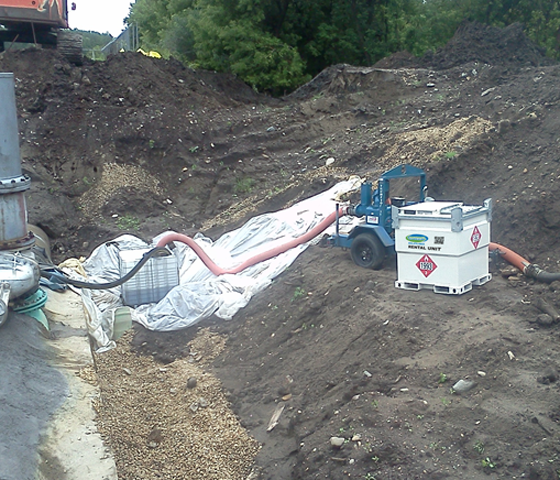 Our rental units are ideal for use in locations where site congestion must be kept to a minimum. The customer can have rental units refilled and may also move it around the job site. Our customers can be confident that upon delivery, our fuel rental units are free of all particulates and condensation. This keeps equipment at its top performing capability and diminishes fuel issues. Fuel tanks cannot be cleaned unless they have a large man-way; our portable rental units have man-ways for easy servicing. 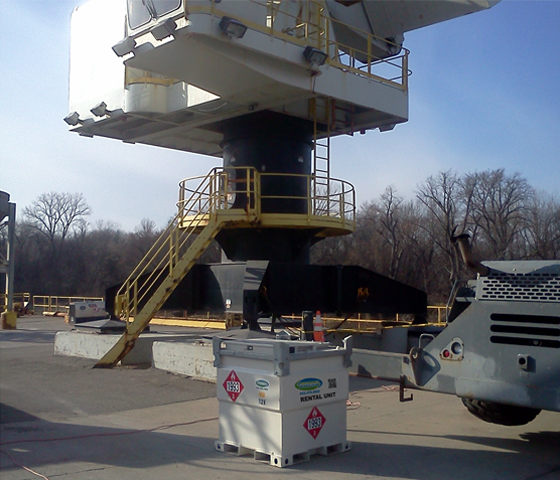 Our rental units have a smaller footprint compared to conventional storage tanks which keep site congestion to a minimum and keep our customers compliant with MPCA regulations. Once on site, the rental unit may be moved around the site to supply more than one piece of equipment. They are designed to be moved with product in them. Secondary containment is always incorporated within the rental unit. Our rental units are made to be moved around with little consequence. Tanks, comparatively are not to be moved with product in them. Our rental units tank walls are thicker than regular tanks, therefore less chance of damage / release. 110-volt pump, 12-volt pump or manual rotary can be used as transfer method. Performance Petroleum’s current team leader, Jon Mayer, was involved with providing fuel assistance for the 35W bridge rebuilding project. “I wish we had this style of portable fuel rental units available to us then” states Mr. Mayer. 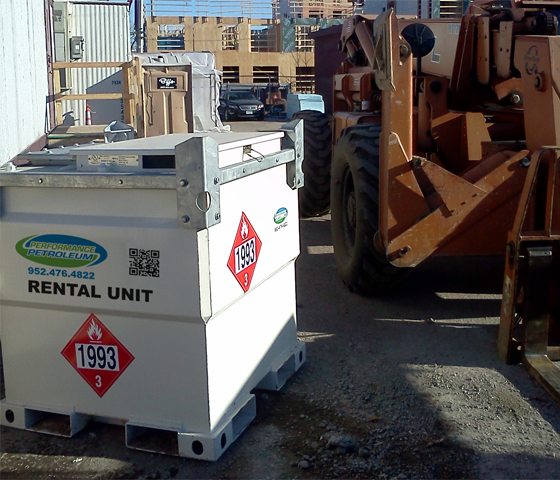 Going forward, Performance Petroleum will only supply our customers with fully compliant rental units such as the PFP and portable fuel cube.